It was always a given that a film like Cigarette Ki Tarah would struggle to even get a good release for itself. This is what happened as major multiplexes stayed away from the film and even at single screens it didn’t get a good release. Worse, the film wasn’t even reviewed by most and those who did thrashed it completely. A no-show by all means with nothing redeeming whatsoever to take home, the film has proven to be a non-starter at the box office with practically negligible collections. Ditto for ‘Myoho’ that arrived unannounced and made one wonder what it was all about at the title stage itself. It got better reviews than Cigarette Ki Tarah but poor release and zero buzz meant that it too couldn’t rise to the occasion. The Last Act, a concept film by Anurag Kashyap, hardly saw any good screenings for itself which means despite good reviews, there wasn’t much going for it. It may just hang on for a week but with no promotion whatsoever and post-release buzz missing as well, there are slim chances for it to bring in any moolah. 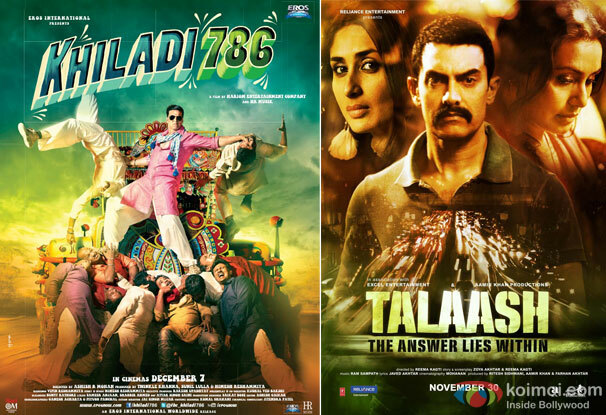 Meanwhile Khiladi 786 and Talaash continued to enjoy an extended run and managed to strengthen their box office standing at single screens and multiplexes respectively. Absence of any competition as well as belonging to entirely contrasting genres has helped both films as they are not eating into each others’ business. Also, their overall verdict would now be far better than what it had seemed immediately after their release. While Khiladi 786 may just manage to touch the 75 crore mark, Talaash now has an outside chance to cross the 92 crore total of Excel’s Zindagi Na Milegi Dobara.